During the past few weeks, snow plows have had little rest in the Boston area and Central Massachusetts. For most of us, they have been part of the background noise of a harsh winter and we have not even noticed them. But as of this week, two people have died as a result of snow plow crashes in the Boston area. Please be aware of the risks and talk to your family members about how you can stay safe. On Monday afternoon, a 60-year-old employee at a Whole Foods store in Medford was struck and killed while walking across the store’s parking lot. The employee was just leaving work. The area was not open to the public at the time. The snow plow was operated Yerardi Landscape and Design of Medfield, authorities said. The snow plow accident remains under investigation by Medford Police and the Massachusetts State Police. A week ago, a 57-year-old Weymouth woman was struck and killed by a snow plow driver who was clearing the parking lot outside her condominium complex, Tara Gardens. The driver had just cleared the woman’s parking space for her and a friend told The Boston Globe she had gotten out of her vehicle to ask him not to block her vehicle in as he left. Weymouth Police and the Norfolk County District Attorney’s office are investigating the snow plow death. 1) Listen to Advisories. Follow the recommendations of state and local officials about when it is best to avoid walking or driving outside. 2) Wear Neon-Colored Vests and Bright Clothing. If you are walking in the street, a neon vest or bright clothing should be a requirement, even during the day. You want snow plow drivers, as well as other drivers, to see you. Keep a vest in your car. You can use your vest when walking from your car to your destination. It may also come in handy someday if you break down. 3) Do Not Approach Plow Trucks. Pedestrians should never approach plow trucks. Let them stay focused on removing snow. 4) Contact the Property Owner Instead. If you live in an apartment or condo complex, keep the phone number of your building management company handy on your cell phone. If you have a complaint, take a photo to send to the building owner, who can share it with their plow company. Do the same if you work at a business office, unless you are the owner; then safe snow removal is your responsibility. 5) Expect Plows Everywhere, Even After the Snow Ends. Expect plows everywhere for a while. Even when it is not snowing, expect plows will be out trimming down high snow banks and opening up narrow roads. 6) Do Not Follow Plow Trucks Too Closely. 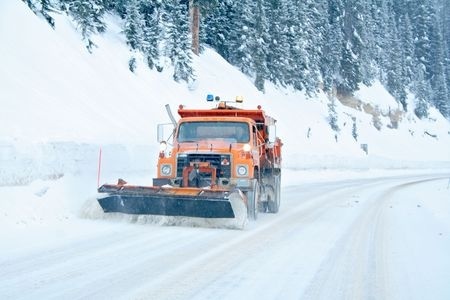 When driving, stay a few car lengths behind plow trucks. The snow plow could hit something hard unexpectedly and not be able to stop. Avoid passing snow plows. 7) If You Have An Accident with a Snow Plow Truck. If you are driving, make sure you stop in a safe place. As you do, take note of what the plow truck looks like and the license plate if you can do so safely. If the plow driver does not stop, immediately notify the local police department to file a car accident report.